Entering the 2017 awards season landscape just in time this year comes the debut feature from renowned screenwriter Aaron Sorkin. Molly’s Game is based around the story of Molly Bloom (Jessica Chastain), a former olympic athlete who enters the seductive and dramatic world of high-stakes poker. After dropping out of law school against her parent’s wishes, Molly moves out from her childhood home in Colorado to a small Los Angeles apartment for what she terms “a fresh start” and quickly gets a job hosting a few weekly poker games. What starts out as a side gig to help make rent quickly turns into a obsession for Molly as she discovers the secret to hosting a great poker game is to bring in the game’s most elite and richest players. This includes a variety of Hollywood stars, Silicon Valley CEO’s, Wall Street investors, and – eventually – the Russian mafia. Things get messy. Sorkin’s film is presented in a series of flashbacks and flash-forwards (often narrated by Bloom), allowing us to simultaneously see the events before and after her poker-hosting career. The narrative cuts here are fast and ruthless, keeping pace with Sorkin’s signature style of fast-talking characters. This is used to achieve a dizzying and something jarring effect, but the film has a lot of fun in letting us know we are watching a movie about a story of a true story (Sorkin’s script is loosely based off Molly’s own book). A writer known for his impressively glib dialogue, Sorkin’s directorial skills unsurprisingly bring a sense of glitz and gaudiness to the screen. Unfortunately, having such cynically facile storytelling in the film’s first half means that scenes in the latter parts of the film don’t quite have the emotional weight behind them that they should. Two scenes in particular (one involving a violent criminal act and the other an intimate conversation) feel so artificially shoehorned in, complete with the expected melodramatic score sounding right on cue. At a bloated 140 minutes, Molly’s Game doesn’t feel nearly as epic as it does exhausting. Despite it’s setbacks, the film is still a really compelling watch. Narrative moments whiz by at a TV spot’s pace and Chastain’s confidence and resolve in her character keeps you glued to the screen. Equally as good is Idris Elba as her last-resort attorney (it’s not a Sorkin script without a good legal scene in there somewhere) and the two work magic together. It may lack the emotional sincerity of other films Sorkin has penned, but it runs just as smooth and flashy. Bottom Line: Ferociously entertaining but ultimately shallow at points, Molly’s Game is a 2+ hour onslaught of witty, compelling, and silver-tongued moments glued together by top-notch editing and solid performances. So he were are. 2016 is history and as we look back on the best films of the year, we can also look towards the future and what’s coming down the cinematic pipeline. Here are my top ten most anticipated films -(provided we make it far enough in the age of Trump to actually watch them). You can check out last year’s most anticipated here. What’s it about? A young skier who get’s her own FBI investigation after creating an international poker series. Why is it on the list? Aaron Sorkin is stepping into the director’s seat here, adapting a memoir by Molly Bloom. One of the finest screenwriters of our time, I’m curious to how Sorkin does behind the camera. Jessica Chastain and Idris Elba costar. What’s it about? All we know at this stage is that the plot has something to do with a team of scientists heading into the jungle for a secretive experiment of some kind. Why is it on the list? Because Ex Machina was one of the most wholly original and singular sci-fi films in recent memory and Alex Garland has teamed up again with Oscar Issac. Tessa Thompson, Jennifer Jason Leigh, and Natalie Portman round out a dream team of actors. What’s it about? A Native American reservation becomes a murder scene which prompts an FBI investigation led by a veteran tracker. Why is it on the list? Another accomplished screenwriter making a directorial debut. 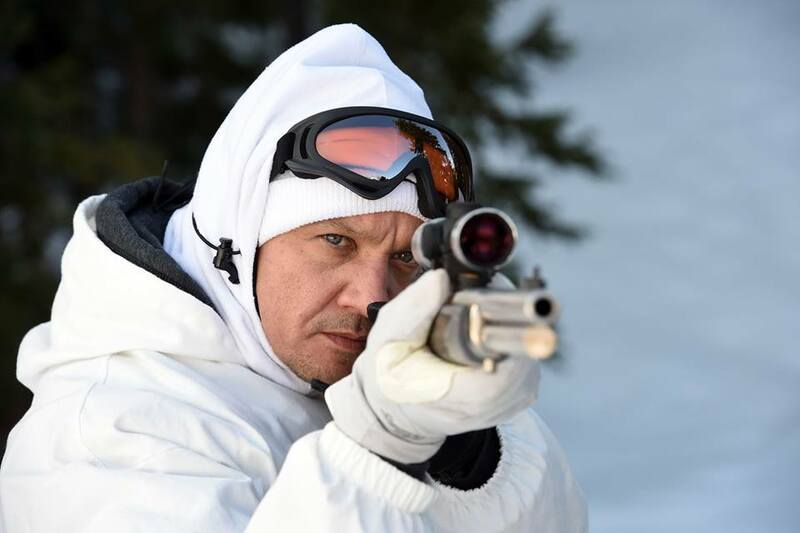 Taylor Sheridan‘s scripts for Sicario and Hell or High Water were both brilliant and I’m curios to see the acting duo of Elizabeth Olsen and Jeremy Renner in a non-superhero context. 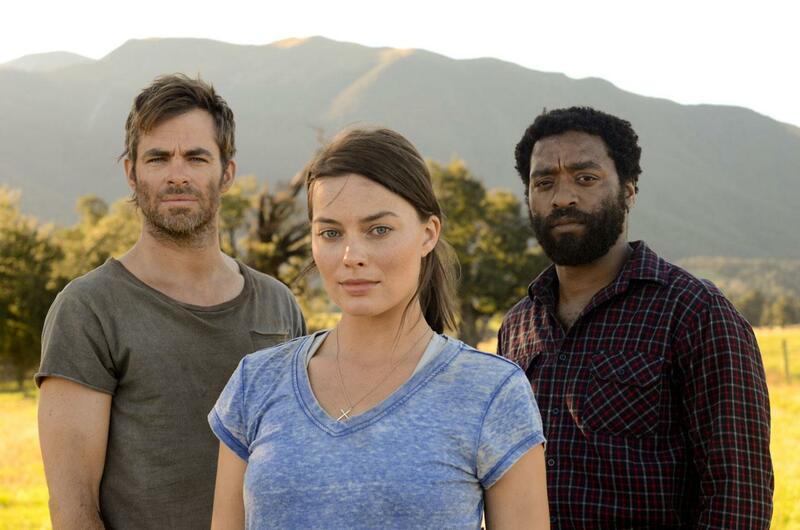 Release date – Unknown for now, but I’m hoping to catch this at Sundance. What’s it about? A blood soaked love story of sorts set in Texas. Also, cannibals. Why is it on the list? I wasn’t the biggest fan of Ana Lily Amirpour’s Iranian-western-vampire coming of age story A Girl Walks Home Alone at Night, but I was intrigued enough to see she had major directing potential. This new effort seems to have a Tarantino-influenced vibe and features a slew of great character actors including Jim Carrey, Keanu Reeves, Giovani Ribisi, and Diego Luna. Release date: Though it’s played a few festivals, a widespread release date is unknown. What’s it about? A revenge thriller about a women tracking down the thieves who burglarized her house. Why is it on the list? 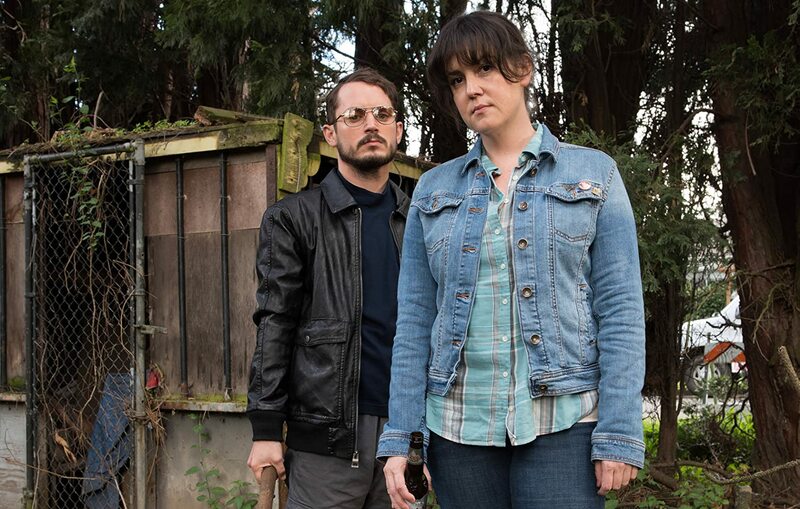 Fresh from his role in Jeremy Saulnier’s excellent, white-knuckler Green Room, actor Macon Blair takes a shot at directing his own original script. The premise sounds gleefully Coen-esc. Why is it on the list? Because it’s Darren Aronofsky’s first film since the interesting-but-ultimately sub-par Noah. 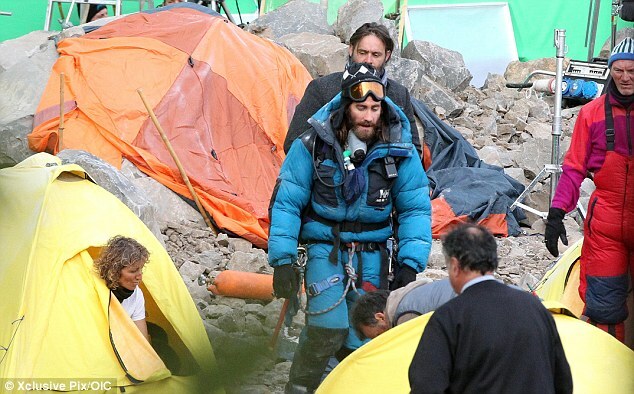 Jennifer Lawrence, Javier Bardem, Domhnall Gleeson, Michelle Pfeiffer and Ed Harris star. Why is it on the list? Christopher Nolan is one of the rare few directors who can effectively blend pedestrian blockbuster fare with an inspired artistic vision. This has potential to be one of 2017’s biggest critical and commercial hits. What’s it about? A boy gets dumped by his blind girlfriend. Why is it on the list? Though Lemon is her first feature, Janicza Bravo has one of the boldest directorial voices in indie film today mixing awkward sensibilities reminiscent of films like Napoleon Dynamite and the works of Todd Solondz and Wes Anderson. Check out her short Gregory Goes Boom! (NSFW) which also stars Michael Cera and Brett Gelman to get a taste of what we might expect from Lemon. What’s it about? A sequel to the 1982 Ridley Scott film Blade Runner. Why is it on this list? Though most modern sequels/reboots don’t hold a candle to their origins, the fact that this is being helmed by Denis Villeneuve (Prisoners, Arrival) and shot by cinematographer legend Roger Deakins (1984, No Country For Old Men, Skyfall, and so, soooo many more) might be reason enough to make an exception. The icing on the cake is a top-notch cast consisting of Harrison Ford, Ryan Gosling, Robyn Wright, Mckenzie Davis, Dave Bautista, Jared Leto and Barkhad Abdi. Why is it on the list? The Lobster was unexpectedly my favorite film of 2016 and, I’m itching to see what Yorgos Lanthimos is cooking up. Director and screenwriter J.C. Chandor reaches auteur status with his latest drama featuring outstanding performances from Oscar nominee Jessica Chastain and (should have been nominee) Oscar Isaac as a business couple facing increasing pressures during a desperate property purchase. The film marks Chandor’s third feature following 2013’s excellent survival drama All Is Lost. The year is 1981, and crime rates in New York City have just reached an all-time high. Our protagonist Abel Morales (Oscar Isaac), is the proud owner of a Standard Oil branch and he is about to close on a very important piece of property that would connect and open up his business in a new part of town. Violent attacks on Abel’s oil trucks are becoming more and more common as he is reaching a settlement with the previous property owners, creating doubt and an uneasy tension between his business’ financial investors. Adding to the mix is the local District Attorney Lawrence (David Oyelowo), who has a serious determination to prosecute Standard Oil for fraud. A Most Violent Year is a fantastic film that deeply examines one’s determination to make it to the top. In a brilliant character display, Chandor gives his audience a detailed look at the complex frustrations that make his characters tic while under enormous amounts of stress. It’s a brilliantly written piece as well with many unexpected moments that do not distract from the overall narrative. Isaac, (who proved himself a serious dramatic actor worth keeping an eye on in last year’s Inside Llewyn Davis) returns in full force here with one of the year’s best performances. Jessica Chastain’s role is equally as impressive (a complete snub at this year’s Oscar Nominations) as Abel’s mysterious and calculating wife Anna who is in charge of the administration and financial side of Standard Oil. As an introspective character piece that still manages to be grippingly tense, A Most Violent Year is one of 2014’s best films because of Chandler’s superb craftsmanship and his commitment to telling complex adult fare reminiscent of early Scorsese or Coppola. The fact that this film didn’t receive a single Oscar nomination still has me perplexed. Interstellar marks acclaimed director Christopher Nolan‘s 9th feature film, and the first after his hotly anticipated conclusion to the Dark Knight trilogy in 2012. Over the course of his career, Nolan has made a reputation for delivering intellectually puzzling blockbuster pictures and Interstellar might be his brainiest and most puzzling film yet. The film stars Matthew McConaughey as Coop, a rural corn farmer and father of two children. Corn is one of the few crops that can be grown because sometime in the near future, a global dust storm wipes out nearly all forms of agriculture. Coop is an incredibly scientific man, quick to disregard his daughters complaints of a paranormal presence because it offers no scientific explanation. A strange series of events – some in connection with this “ghost” and others pure happenstance – enables Coop and his daughter Murphy to stumble across an opportunity for space exploration as a last result attempt to save the human race from extinction. If that description sounds a bit loaded, thats because it is. And we haven’t even finished the first act yet. Things quickly go from a family drama to a graduate metaphysics theory to Gravity-esc space survival to alternate dimension weirdness to time loops and then back to a family drama again. Nolan tries cramming in all sorts of ideas and concepts into a hefty 169 min runtime. Quantum physics, gravity pulls, beings from another galaxy, time anomalies, human evolution, singularities – it’s enough to make your head spin. Thankfully we have Anne Hathaway‘s character Amelia (in a similar fashion to Ellen Page‘s character from Inception) providing exposition to guide us through the this tangled mess of wormholes, black holes and plot holes. The main problem with Interstellar is that Nolan assumes his audience is smart enough to grasp complex concepts about the nature of time and space, but somehow stupid enough not see bad writing when it stares us in the face. The script is pretty much passable, and at sometimes, just outright bad. Same goes for many of the film’s performances. Nolan has never been a great dramatic director, but he gets the job done here with the help of an ensemble cast including Casey Affleck, Jessica Chastain, Wes Bentley, Michael Caine, Topher Grace, Ellen Burstyn and an actor I won’t mention for sake of surprise. 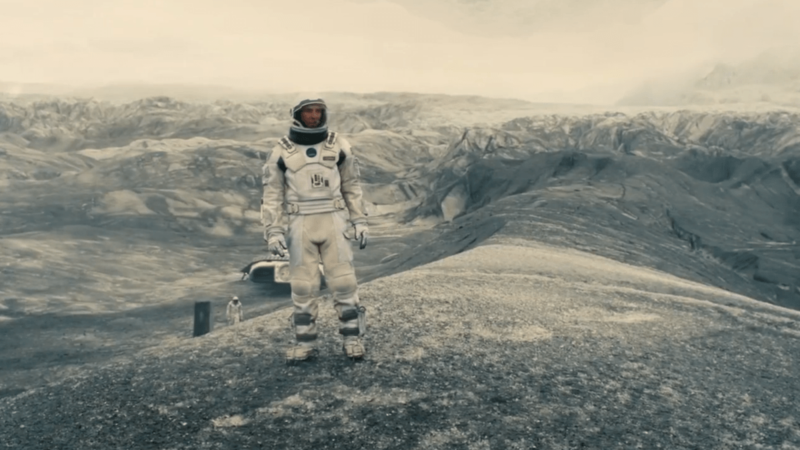 However, the flaws of Interstellar are relatively minor compared to its epic aspirations or its technical brilliance. Beautifully shot in 70mm, Interstellar looks amazing, and is sure to deliver on terms of sheer spectacle. There is some jaw-dropping scenes of space/time travel and the score by Hans Zimmer and incredible sound design make viewing the film a pleasurable and visceral journey. 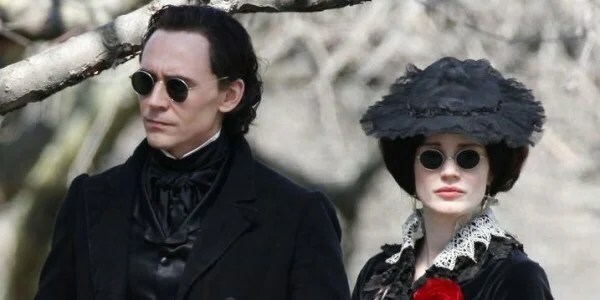 While the film certainly is too ambitious for it’s own good, I would rather see a film take gargantuan risks and (slightly) fail than I would see a film play it safe. Especially when it comes to the epic budget and scope of a canvas that Nolan was given to work with here. What it really comes down to is this: Christopher Nolan’s dreams are as big as those portrayed in Inception, and seeing his vision unfold in such a grand manner is a delight.